I recently purchased an Asus EeePC 1201N for the purpose of running OS X Snow Leopard, Windows 7 and some flavour of Linux. Each OS has a different purpose. I’ve been looking for a lightweight laptop to take with me when travelling, specifically for the purpose of importing my photos, geotag them and keyword them while things are fresh in memory. Aperture is my tool of choice, so I needed something with enough oomph and a decent enough display. Windows is purely to get to know it, as I haven’t touched it since XP days, and I’m getting rusty. Linux is what I use at work, and what I use for a lot of things outside of my day job. As you might know, the wireless card in the 1201N doesn’t work in OS X, and the Dell 1510 card is widely recommended. It uses a Broadcom BCM4322 chip, which works natively in OS X. Unfortunately Broadcom chips tend to be somewhat shaky in Linux, unless you go with ndiswrapper for driver support, which wouldn’t work for my needs, so I had to look for something else. Things are further complicated by the 1201N using a low-profile Mini-PCIe card. There aren’t too many of them around, and finding one that has good driver support in both OS X and Linux, wasn’t easy. 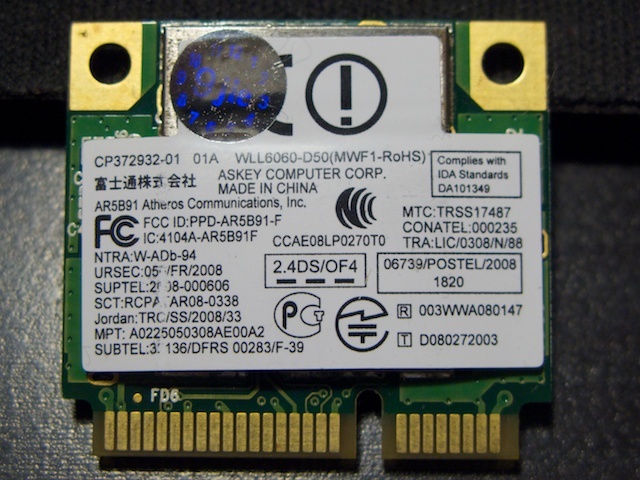 Fortunately I stumbled upon a card based on the Atheros AR5B91 chip, which I know will work in Linux, and works natevly in OSX.